Disney characters and artwork are property of ©Disney, Disney/Pixar characters. 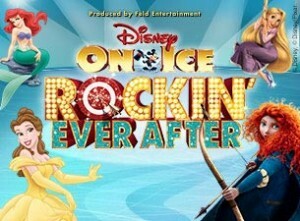 Coming soon to the Patriot Center in Fairfax- Disney on Ice presents: Rockin’ Ever After!! “A century of classic and new Disney stars are taking the ice to share memories, laughs and excitement with you and your family. Jam to a Scottish jig as Merida, the sharp-shooting, headstrong heroine from the latest Disney•Pixar blockbuster film, Brave, makes her ice debut! Experience a show-stopping performance as Sebastian breaks out of his shell for one night only to make waves with The Little Mermaid herself, Ariel. Wednesday, October 17th @ 7:00 p.m.
Thursday, October 18th @ 7:00 p.m.
Friday, October 19th @ 10:30 a.m. and 7:30 p.m.
Saturday, October 20th @ 10:30 a.m. 2:30 p.m. and 6:30 p.m.
Sunday, October 21st @ 12:30 p.m. and 4:30 p.m.
Tickets are on-sale now and can be purchased at all Ticketmaster outlets via charge by phone at 1800-745-3000; via www.ticketmaster.com; and at the Patriot Center box office. But….let’s be honest….you’d rather win these, right? Send an email to info@pwcmoms.com with your favorite princess as the subject line! I’ll be picking 5 4-pack winners! PLEASE NOTE: THESE TICKETS ARE FOR THE PERFORMANCES ON WEDNESDAY/THURSDAY/FRIDAY ONLY. Please only enter if you can attend. Best of luck! Contest ends September 28, 2012 at midnight! !